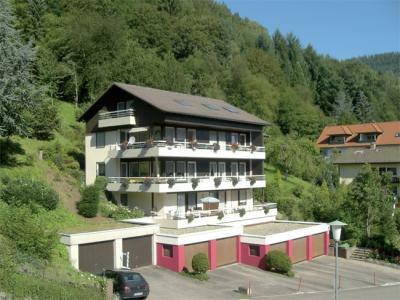 2 vacation apartments near the Vital Therme, the spa facilities and the spa park. Beautiful view. The original Bad Wildbad therapy is for people with back problems and for illnesses of the musculoskeleton system. For booking this package deal a cure prescription by your doctor and the approval of your health insurance company (absorption of costs) are required. Besides 21 nights in the chosen accommodation there are 3 doctor's appointments, single-physiotherapy with and without "Schlingentisch", different massages, physiotherapy inside the thermal water, natural fango bath with massages, different bath and moving excercises in the thermal water included. Additionally you will get our bonus guest card.